Kwakwee (Zee) Baker has a real passion for directing with experience in camera and editing. Kwakwee brings an array of talents to the production team winning film awards for his work in; action films, commercials and documentary. A team orientated professional, Kwakwee is open to new and innovative platforms that push the boundaries of the known media. 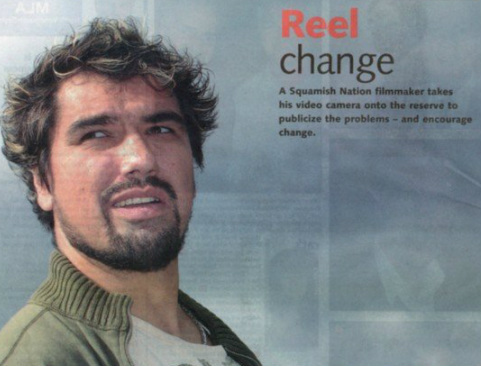 A Squamish Nation filmmaker takes his video camera onto the reserve to publicize the problems – and encourage change. Kwakwee Baker stands inside a rehab centre-turned-crack house on the Squamish Nation reserve listening to four intoxicated band members recount where it all went wrong. The irony of the situation hangs thick in the air: they’re sitting in the dilapidated ruins of a treatment facility. But no one seems to notice. With his video camera resting on his shoulder Baker asks, “What do you think should be done?” They answer, and he immediately knows their responses will end up on the cutting room floor. He won’t show their faces either. He doesn’t want to embarrass his community or point fingers. Instead, he hopes to hold up his film like a mirror and say, “These are our problems. We shouldn’t be ashamed, we should fix them. ”The scene outside the front door is equally telling. The field between this graffiti-covered house is littered with twisted metal and random objects: a blue-striped mattress, a chair with broken legs, a mangled bed frame. A red house faces the road. It sits defeated with shattered windows like chipped teeth. Icicle Christmas lights dangle limply from the roof as if to say: this was once a place worthy of hosting celebrations. The side door is wide open and a thick layer of dust covers the concrete floor inside. Overhead a single light fixture casts a dim eerie glow. This is another known crack house in what is silently becoming a ghetto. Back when Baker was a kid this area was all forest. He used to hunt pheasants and play here. He wishes that was still how kids spent their time. It seems so many of them are addicted to hard drugs, smoking pot or pregnant much too young. They light up their crack pipes out in the open now, right across the street from where young children – including his own – kick around soccer balls in their front yards. But inside this house, listening to his people talk about their suffering, he can’t get angry. Their stories only strengthen his resolve to make a difference. He cares about everyone in this community. And that’s why he’s decided to risk a backlash to make this film. “It needs to be done. If I don’t do it, who’s going to do it?” kWAKWEE BAKER is sitting inside the First Step Actors Workshop office talking about Ashamed Society, his sure-to-be controversial film that will be screened at the North Shore Film Festival of Life Oct. 19 and 20. Only one other Squamish Nation band member knows about the project. Baker is hoping the film will inspire more people, specifically kids, to pick up a video camera and tell stories. But he’s expecting a few to be upset too. “I’ll be a laughing stock. People will poke fun at me,” he says, matter-of-factly. “But I like to tackle the (stories) people don’t want to.” Russell Porter, founder of the festival, is seated next to him. “My hope is he’s the one person who stands up and the rest follow. What we’re hoping is, even if five people (see the film) two more will follow then a few more the next year,” he says. “A snowball effect,” Baker summarizes. The two men are childhood friends and it was their serendipitous reunion that helped launch this production. Baker has dabbled in the film industry for the last 20 years, shooting extreme sports films and acting in commercials and locally-shot TV shows. But it wasn’t until recently that he decided he wanted to try out film making. The idea to create a film that sheds light on the stereotypes associated with aboriginal people was always percolating in the back of his mind. When he read a newspaper article about Porter’s film festival – with its mandate to expose (or celebrate) little-known community issues – he decided to get in contact with his old friend. Baker was lucky. His grandmother was a chief and she was adamant that her progeny would tend to their roots, learn traditions and pass them on. He believes much of the Squamish Nation’s problems stem from their shame of culture, largely a result of the residential school tragedies of their past. As recently as 22 years ago, First Nations children were gathered up and shipped off to church-run, government-funded schools to have their culture, traditions and language stripped away.“ (Survivors) don’t want to teach their culture because they were taught not to at residential schools. They had cigarette butts put out on their tongue or (they were) raped or beat. So, they don’t teach their culture or they teach the opposite, they teach the abuse instead,” Baker says, standing outside a cluster of sweat lodges that are nestled in the forest at the edge of the reserve. The lodges stand in stark contrast to the crack houses less than two kilometres away, both in appearance and with their impact on the reserve. They’re shaped like igloos, made up of bent branches and covered with layer upon layer of tarps and blankets. Inside more blankets line the ground. At the center of the circle there’s a fire pit. This is where members of the band come to meditate and pray. And the same way residents of Canada’s richest area code don’t see the squalor conditions on parts of the reserve, they also have no idea about these sacred grounds. It was important for Baker to include the beautiful aspects of the reserve in his film as well. It feels peaceful here, despite noise from the construction taking place just out of sight. Baker seems slightly nervous about bringing outsiders to this spot. There are strict rules about where you shouldn’t walk and everything from antlers to rocks is deliberately placed. “You should see this place on a nice winter day,” he says. “All you can hear are the ravens and the fire.” His sense of pride is palpable and it is at the heart of Ashamed Society. Beyond the images and words in the film there’s a plea: put down that poison, set aside your video game controllers, leave behind your scars and re-discover what it means to be First Nations. Ashamed Society went on to win Best Documentary for the North Shore Film Festival 2007, it was Kwakwee first film and Documentary where he; Wrote, Directed, and Produced.